The first time I met Chef Alain Giraud he made Rémy cry ! We were dining at the since closed Anisette and Rémy was eating the strawberry vacherin. Giraud playfully took a little of the Chantilly cream and put it on the end of Rémy’s nose. We all laughed. Rémy burst into tears. 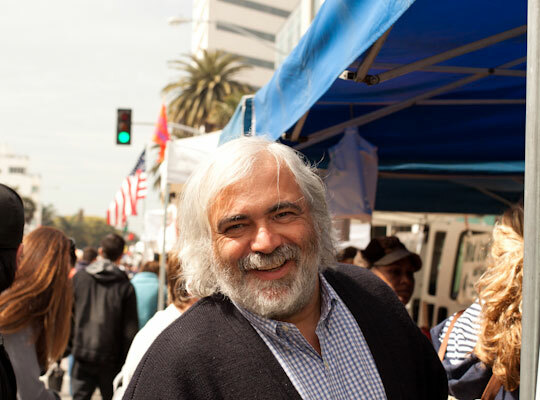 Since then we have all become great friends – bonding during shopping at the Santa Monica Farmers’ Market, our love of The Tudors, many fishing trips where Giraud is always life and soul of the party and regular coffees on Wednesday mornings. A plain French omelet is perhaps, one of the most difficult of all things to make ; that is, it is the most difficult to have well made in the ordinary private house. 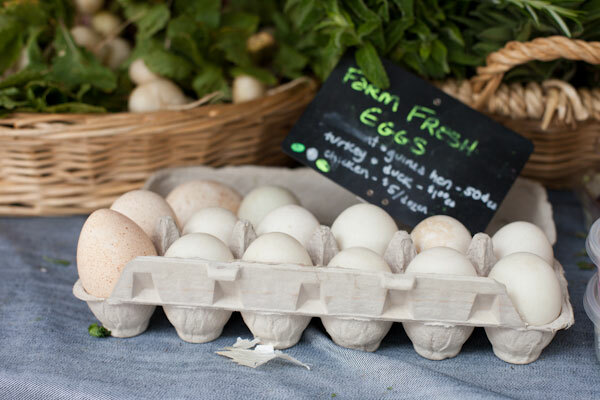 Failures come from beating the eggs until they are too light, or having the butter too hot, or cooking the omelet too long before serving. There is no better form in which to serve eggs than as an omelet, but so few people make a good omelet that that is one of the last things the inexperienced housekeeper or cook with attempt. Yet the making is a simple operation, the cause of faliure usually being that the pan for cooking is not hot enough and too much egg is put in at one time. When there is too much egg in the pan, one part will be cooked hard before the other is heated through. 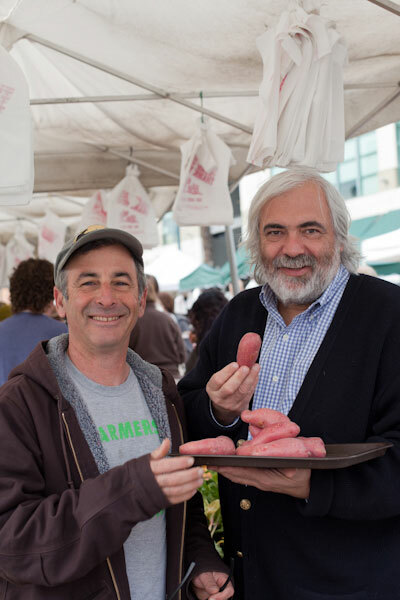 Giraud and I meet at the Santa Monica Farmers’ market on a sunny Wednesday morning to shop for omelet ingredients and to get some pictures for Made in America. Spending any time with Giraud is always fun, flirtatious and undeniably French. 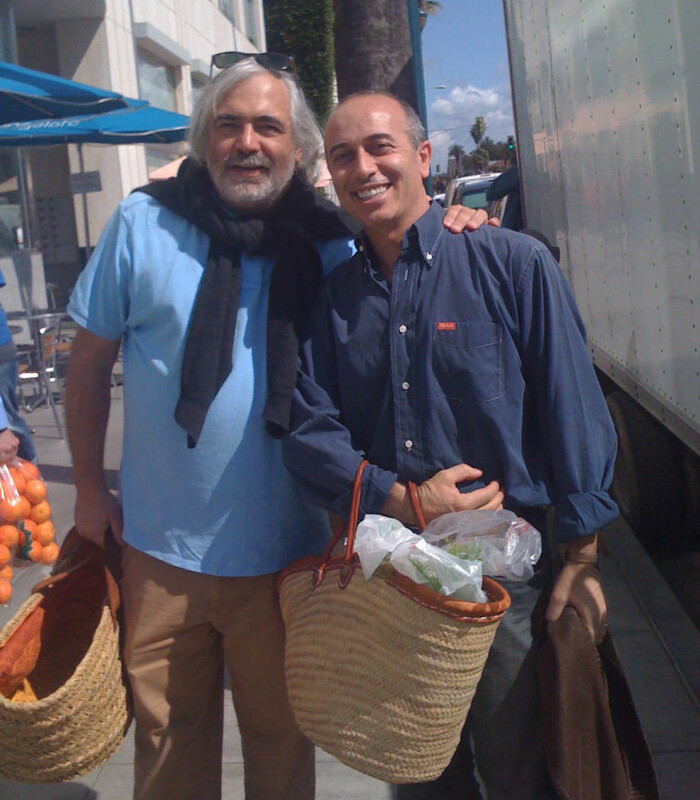 He’s had his weekly coffee with Donato Poto of Providence, something that happens every Wednesday at the market. We stop to share a joke and a giggle with Poto and this sets the tone for the rest of our morning together. They are both carrying their traditional French market baskets – Poto’s is full and he is heading back to Providence leaving Giraud and me to shop. 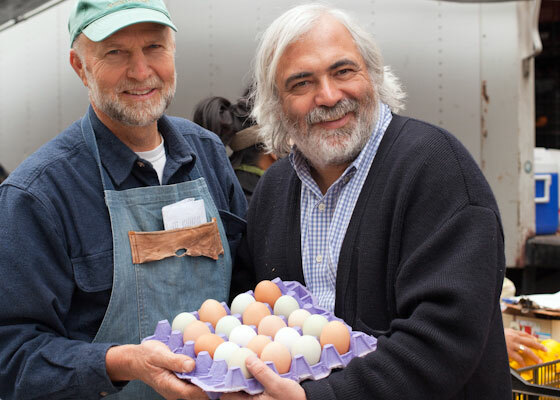 First stop is the Weiser Family Farms stand to chat with farmer-owner, Alex Weiser and to pick out a few French fingerling potatoes for the omelet. Giraud is a regular at the market, he stops to shake hands with a friend, greets a farmer and knows which stall is best for every ingredient. He knows everyone and we can’t walk five paces without Giraud stopping to talk to someone. At the Schaner Farms table Giraud greets Peter Schaner, the owner who is sorting boxes in his truck. “Peter has the best eggs. In France they have a saying On ne fait pas d’omelette sans casse des oeufs [You can’t make an omelet without breaking eggs]. Three years ago I brought Peter’s avocados to my mum in France in my suitcase so she had an avocado from California.” He proudly shows me a picture on his iPhone of his mother holding a bowl of dark green avocados. Giraud’s dream will soon be a reality, this summer – hopefully Bastille Day (July 14th) he is opening Maison Giraud in the Pacific Palisades, a neighborhood restaurant that will serve breakfast, lunch and dinner. 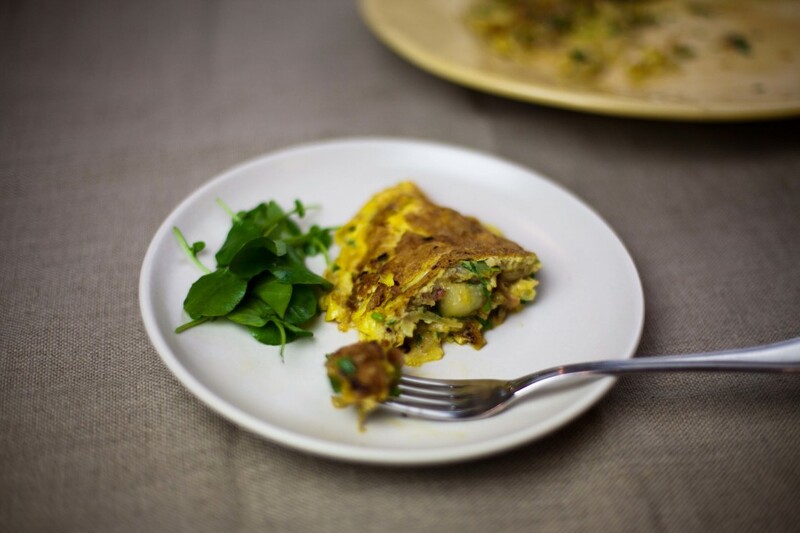 No doubt the French omelet will be on the menu, with a bright frisée salad and perhaps a glass of rosé. Summer is here – what with Wimbledon on the television and the kids off school. I’m getting very excited about going to Provence, where coincidentally Giraud is from. 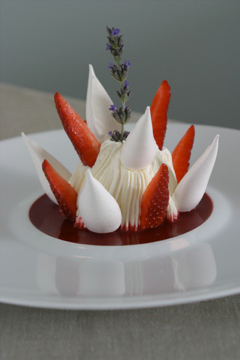 Alain’s Vacherin Glace wraps up all the flavors of summer in a stunning dessert – I think of it as a French gourmet version of my favorite – Eaton mess – with the added bonus of lavender ice cream and those heavenly tasting Harry’s Berries. Impress guests at a fourth of July party or have it for Bastille day (14th July) – I have adapted the recipe and used blueberry coulis for that perfect red white and blue version of summer in a sundae glass. 1. Bring milk, cream, vanilla and half of the sugar to a boil. Add the lavender, turn heat off and infuse for 1 minute. 2. In a separate bowl, combine yolks and remaining half of the sugar. Prepare a bowl of ice water; set an empty bowl on top of the ice water and place a strainer on top of the empty bowl. 3. Temper the yolk and sugar with a small amount of the warm mixture above, being careful not to cook or “scramble” the eggs. 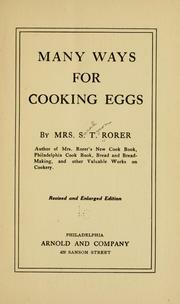 Bring the milk/cream mixture back to a boil and stir in the tempered yolk mixture. Cook, mixing continuously with a wooden spoon, until the mixture coats the back of a spoon, about 3 minutes. 4. Strain into the empty bowl and chill. 5. Run mixture in an ice cream machine until set and place in freezer. 1. Prepare a double boiler bath (Bain Marie). Pre-heat the oven to 200 F.
2. In a mixing bowl, combine egg whites and sugar. Place on the double boiler and whisk for approximately 5 minutes or until mixture is warm to the touch. 3. Remove from water bath and place in the bowl of an electric stand mixer with a whisk attachment. Whip to medium-stiff peak. 4. Using a pastry bag with a medium-sized round tip, pipe onto a parchment-lined sheet in to a teardrop shape (Giraud suggests piping on a diagonal). 5. Place sheet in the pre-heated oven and dry until hard but without color. 6. Remove from oven, cool and store drops in an airtight container. 1. Using the electric stand mixer with a whisk attachment combine cream and sugar. Whisk to medium-stiff peak. 2. Place in pastry bag with a star tip. 1. In a blender, place the blueberries, sugar and lemon juice. Blend at high speed until smooth. 2. Strain. Taste and adjust for flavor. 1. Place 1 large scoop of lavender ice cream in the center of each dish. 2. Pipe Chantilly cream using the star-tipped pastry bag, covering entire scoop of ice cream to form a dome. 3. Arrange the strawberries and meringue drops in the whip cream-covered ice cream. 4. Make a rim of blueberry coulis around the dome. Garnish with lavender sprig and serve immediately. Love those berries! Fabulous dessert! Wow that looks absolutely amazing—both the shopping trip and the dessert. Wow. What a gorgeous dessert and wonderful market suggestions. 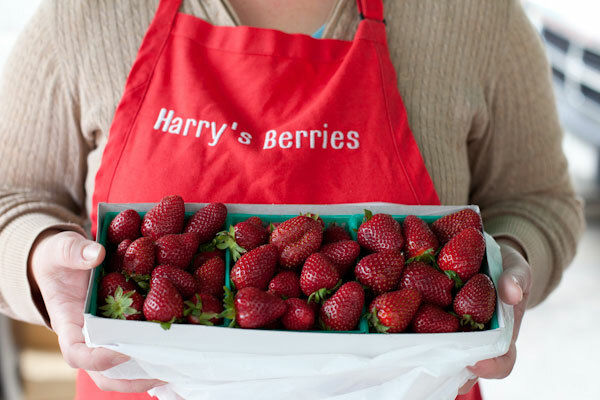 A valuable post for anyone who likes to go to the farmers’ market here in Southern California! Thank you for the insights and lovely stories. Cheers! I’m going to the market you next week! What a fun day and I am a huge fan of Weiser’s potatoes! I cannot wait for your book to come out. It will be such a wonderful celebration! Great, now I know what I’m making for my dinner party on Sunday! !